Launched in 2000, reference 116520 was the first Daytona model to feature a fully in-house caliber. 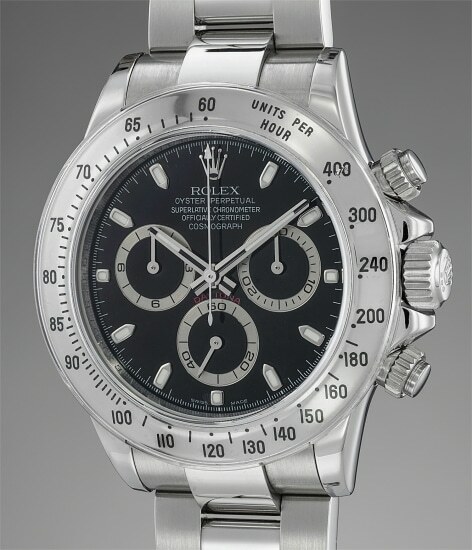 In production for sixteen years, it was eventually replaced by reference 116500, which features a ceramic bezel. Offered in virtually new old stock condition, the present specimen is an exceedingly well-preserved example, having never seen polishing or any intervention throughout its lifetime. Furthermore, this watch is accompanied by its original guarantee card dated November 2008, along with a sales receipt. Both are stamped with the retailer Ronchi in Milan, Italy.